On a winding road to a comeback, ex-Mars Hill Church pastor Mark Driscoll received a standing ovation as he took to the stage at Perry Noble's Most Excellent Way to Lead Conference earlier this month, where he admitted that he started in the ministry too young and would have benefited from the guidance of an older mentor. During an on-stage interview with NewSpring Church pastor Perry Noble, Driscoll explained that at age 19 he was "radically saved" after he began reading the Bible in college. From then on, his life seemed to progress at a rapid pace. At 21-years-old, Driscoll had married his wife, Grace — a preacher's daughter, and by 22 he began hosting Bible study in the living room of their home. "I started ministry, quite frankly, too young," he admitted, adding that he would have benefited from the tutelage of a "godly, older mentor." Over the years that followed, his ministry grew, resulting in the founding of Mars Hill Church in 1996, and the baptism of over 10,000, Driscoll said. 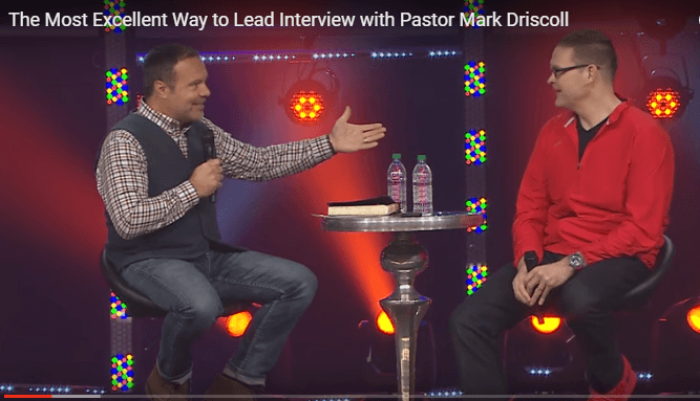 Regarding the early beginnings and rapid growth of the now defunct Mars Hill, Driscoll said, "There were things that God did that I have no credit for or explanation for … I was a kite, and then a hurricane came … Any old kite will fly in a hurricane." At one point during the interview, Noble said that he didn't intend to revisit the events that led to Driscoll's fall in 2014 and the demise of Mars Hill Church. "Not going to unhash everything that happened, 'cause frankly I want you, and I want us, to just move on," he said. Noble did, however, ask Driscoll to share any regrets he had, or any areas where he fell short regarding his recent scandal and the many allegations he presently faces. Driscoll seemed to avoid a direct answer saying, "The people that have helped me to learn in this season — there's a long list of them — have been amazingly kind to my wife and I … There are some things that I would like to learn. There were some things that, if I had been more patient as a young leader, I should've learned … I genuinely am in a season of learning." The ex-Mars Hill pastor likely counts Noble as one of those who has helped him throughout his pubic ordeal. Shortly after Driscoll's Feb. 1 announcement that he was starting a new church, Noble expressed his support for the new venture. "I'm going to choose to believe in Pastor Mark and Grace (Driscoll's wife) as they set out on this endeavor to plant a church," Noble said in video posted to Facebook. "And I just want to say that I support him 100 percent." Driscoll told Noble that he spent the past year surrounding himself with "older leaders and mentors" and that the experience has been like a "graduate school class in leadership. Not talking a lot, listening a lot. Not teaching a lot, but learning a lot ... It's been a remarkable season of learning." Less than two weeks prior to Driscoll's Easter gathering announcement, the pastor was slapped with a lawsuit that named him, former Mars Hill chief elder Sutton Turner and others, alleging fraud and racketeering regarding donor contributions. The Evangelical Council for Financial Accountability, a respected accreditation organization, is also accused of being a co-conspirator in the suit but it is not listed as a defendant. Filed by the Law Office of Brian Fahling, the suit questions how more than $2 million in donations for church planting and a festival were spent. Mark Driscoll's fall has been a dramatic one as he was once described as one of America's "most prominent and celebrated pastors" by Forbes, but he resigned in disgrace as senior pastor of Seattle-based Mars Hill in October 2014 after a confluence of events marred his reputation, including allegations of plagiarism and fostering an abusive work environment. Two weeks after Driscoll's resignation, Mars Hill Church announced that it would dissolve. The Evangelical Council for Financial Accountability (ECFA) is listed in the lawsuit against Mark Driscoll as a co-conspirator but is not a defendant.